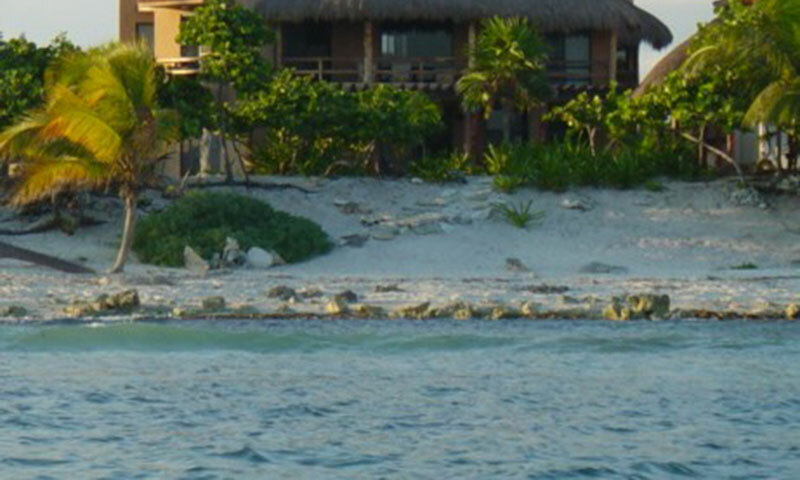 Casa Del Sol Naciente - The House of the Rising Sun - is a spacious five-bedroom, four and 1/2 bathroom, ocean front vacation home that accommodates 8 to 9 people. 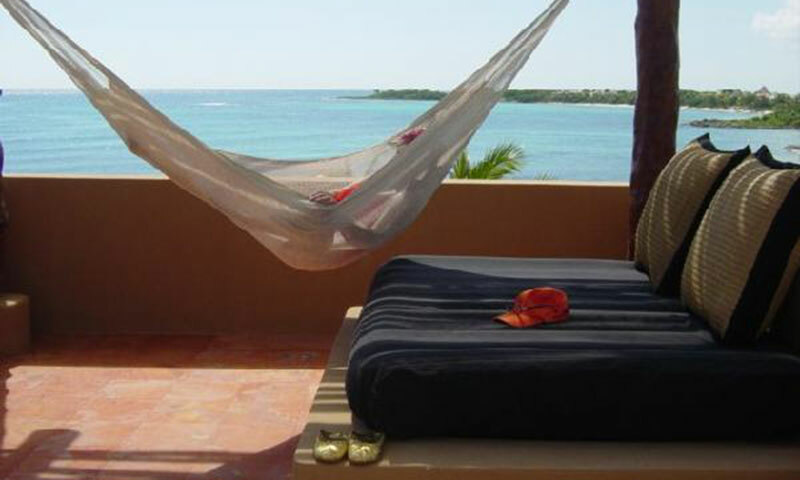 Each bedroom has a Balcony and direct views of the Caribbean Sea. Outdoor living areas are numerous and include an architecturally stunning 55-foot lap pool, a waterfall, and a grand stone-patio for lounging and sunning next to the ocean. 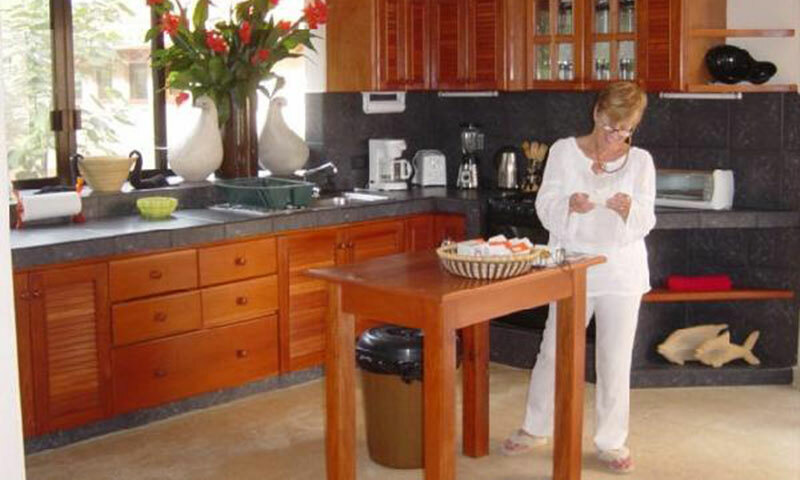 There are multiple areas to relax at Casa del Sol Naciente: a shaded outdoor dining table, seating 12 people with an ocean view is a great spot for breakfast or lunch. A beach-front Palapa with a swinging double bed is like living on the ocean itself, a separate table for four with a shady umbrella is a perfect place for cards or doing a puzzle. Settling into the ocean side Adirondack chairs or the beach loungers makes it easy to snooze while reading a book next to the Sea. The villa staff is there daily to take care of your needs while you are on vacation. Our personal Concierge services will arrange for Chef prepared meals; Professional massages; tour operators; private Yoga instruction; Fishing and Golf - all with nominal service charges. 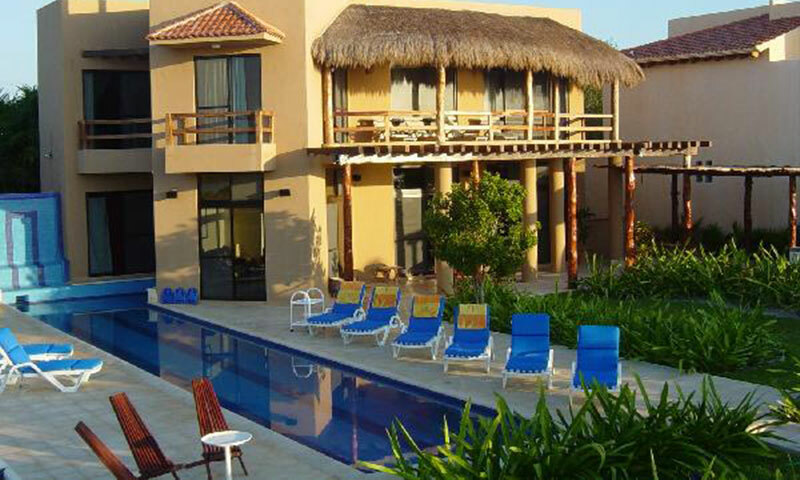 The Casa, a two-story family Villa, is perfect for celebrating a special occasion. Mayan natural limestone floors and an open-floor kitchen-dining-living plan make this a real family home. 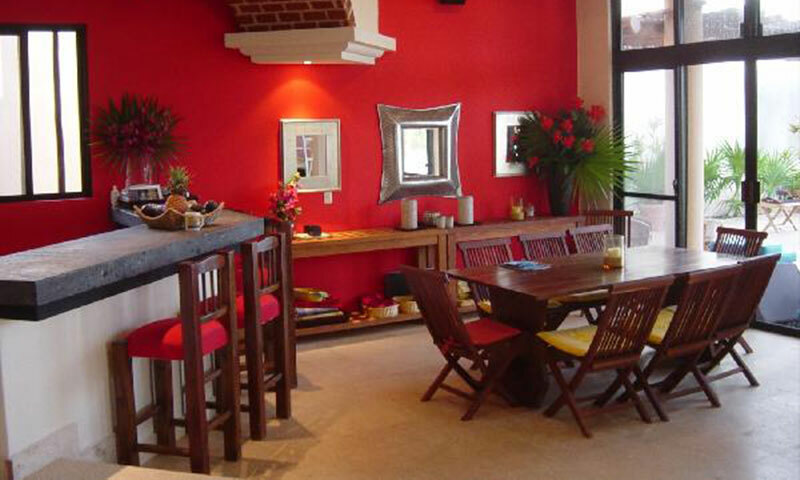 All five bedrooms, with air conditioning, have direct views of the Caribbean Sea. There is a rooftop palapa, which has an air mattress for sleeping under the stars and a vista area for sunset roof top cocktails. The first floor has an open-floor design, with a beautiful Lily garden that walks you directly to the Sea. On the first floor you will find an Entrance Foyer adorned with a local Mayan limestone wall, a brick-domed ceiling that soars two stories above the main foyer, a large open kitchen with an expansive window, a pantry and two sinks. The lava-rock breakfast counter and bar with a brick-arched lit ceiling that can accommodate 10 people adjoins Dining Room with a take table seating 10. The entire first floor has an expanse view of garden and the Caribbean Sea. The living room has a large seating area and Satellite TV, DVD/VCR and music system. The Kitchen is equipped with two sinks and appliances that include a five-burner stove and an oven, a toaster oven, a microwave and a blender. The large main refrigerator is always stocked with condiments. Upon arrival, the separate beverage refrigerator is stocked with Soft Drinks and Cold Beer. Condiments and cooking staples such as sugar, salt, spices, sauces etc. are replenished by the staff. Restaurant quality dishes and utensils are provided. Bottled drinking water is provided and refreshed daily by the staff. Chef Service is available upon request - this service can be coordinated with the Hospitality Manager. The Living Room has a seating and entertainment area. that includes American News channels as well as several movie channels. The entertainment center includes TV with satellite service; a movie library of 40 DVDs and VCR videos. Music CD's are played on a 5-Disc changer and a hook up for your own ipod to the four sets of inside and outside speakers. Indoor Dining Room: You may choose to dine in one of two places. The Red walled Dining room with a Balinese Hardwood table can accommodate 10 people indoors, or you may choose to dine outdoors at the large cement and stone table with cushioned seating and a Mayan shaded ceiling. The first floor Master Bedroom has a four-poster king bed, a private bathroom w/shower and a personal entrance to the pool and waterfall seat. Separate guest Bathroom is inlaid with river rocks. Outdoor Dining Area: On a moonlit night or a breezy afternoon choose to be outside at the polished-concrete dining table inset with local stones.. Seating banquettes easily accommodate 14 people. Placemats, tablecloths and candles are provided. Outdoor Barbecue Grill Fresh Fish or a meat of your choice on the built-in charcoal barbecue -next to the outdoor dining area. 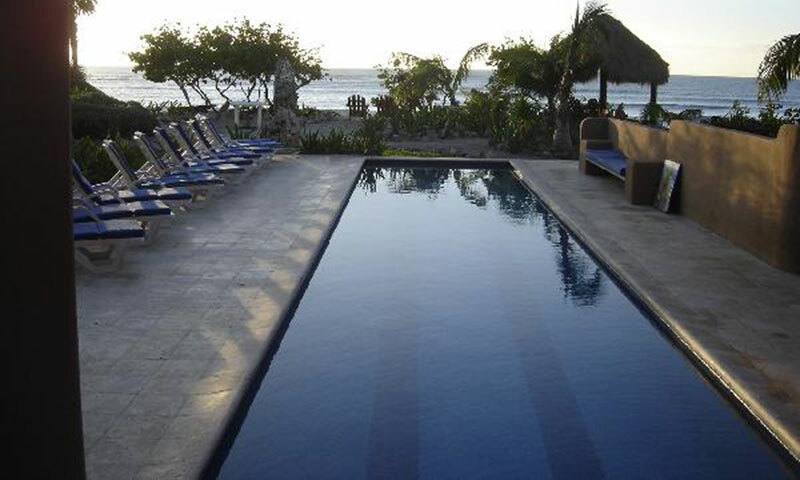 The 55 foot Lap Pool: Casa Del Sol Naciente has a 55-foot long lap pool. The pool at 5 feet in depth is perfect for family play, lounging in the water and.... for Swimming laps. The outdoor Shower is a work of art, made of pickled driftwood found on the beach. It will await you when you return from a snorkel swim in the ocean with a fresh bar of soap next to the Swimming Pool. Ocean Kayaking: You may take out the two 2-person ocean kayaks provided also are life vests...... on calm days the water is so transparent you can see the fish and the coral reef from the surface... You can go out there and catch a wave passing the Riviera Maya reef as it reaches for the beach. For snorkeling - Jade Beach is a "fish hotel" - please be respectful in the water as it is a living reef. The second floor has a large foyer with an indigenous fossilized limestone-wall; the window overlooks the ocean to the balcony area. The brick-domed ceiling meets an oversized hardwood banister which leads to the four bedrooms on this floor. 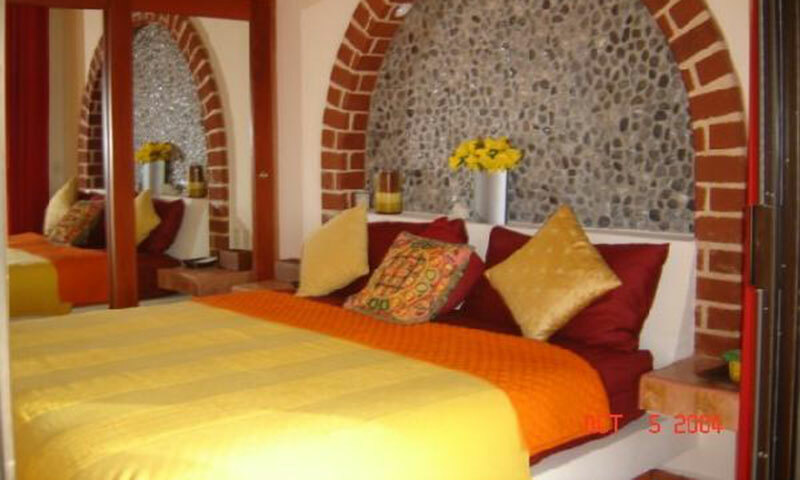 Each of the five bedrooms in the villa is air-conditioned and has a ceiling fan. 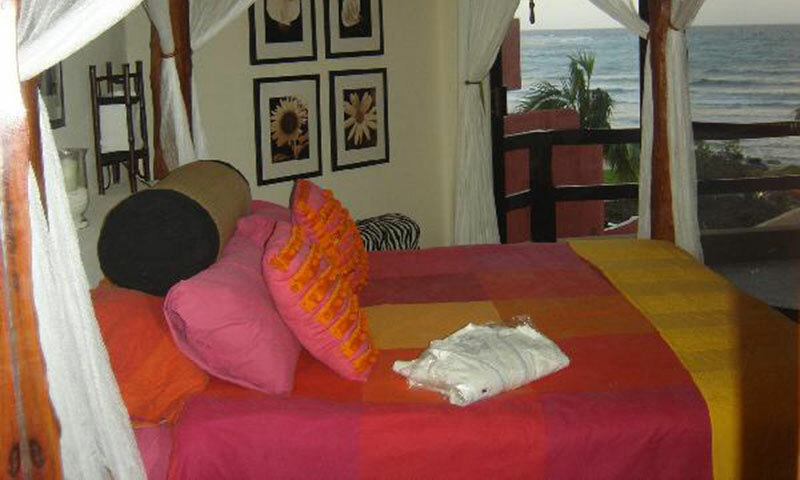 All five bedrooms have direct view of the Caribbean Sea and a balcony. Large closets. Beds are made to perfection with luxury linens, plush pillows. Bathrooms are fully furnished with luxurious towels, soap, shampoo and a hair dryer. All bedrooms have TV's. Three of the bedrooms are equipped with safe deposit boxes. 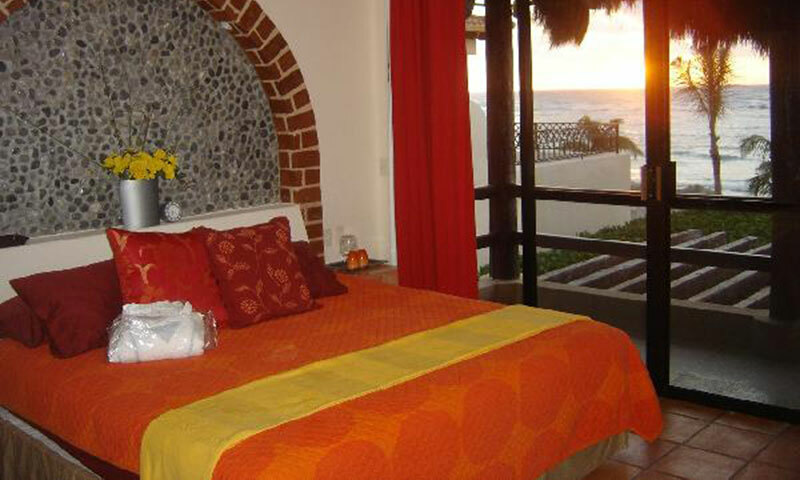 The Sunrise Master Suite has a king-size bed with a brick domed headboard designed with river rocks and a view of the ocean in two directions. Sliding glass doors open to a balcony with four Teak Steamer Lounger chairs. The bathroom is made of Ticul Marble and the oversized bathtub, with shower, made of Ticul stone, is large enough to accommodate two people. The Playa Suite has a King size Bed with a Brick dome with an inset of reading lights. The ocean view is wide and the ability to sleep with just the screen doors closed makes this a great room. The closet has mirrored doors to reflect the ocean view while lying on your bed. The sliding glass doors open to the exterior covered balcony for a place to sit and read. The bedroom has a sink basin en suite and shares a bathroom and shower with the Double Bed Bedroom next door. The Moonrise Suite has Two Double Beds. 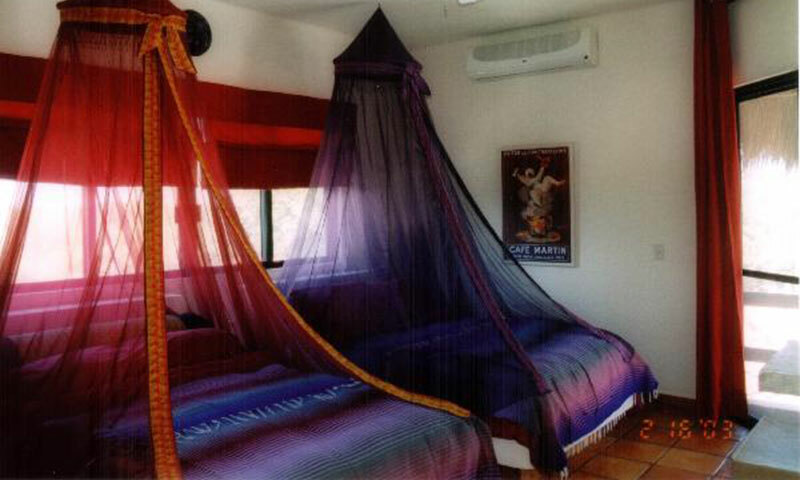 This bedroom has two Mosquito net canopies and a balcony with a view of the ocean. The room was designed to accommodate a person who wants his/her own bed or for a Nanny traveling with children. The two double beds can accommodate up to four children. There is a separate sink in this room and a large closet. Roof top Bed. For reading or sleeping, this is a special space. The rooftop bed takes a Double Bed sized air mattress and can be made up with sheets to sleep under the stars and the moon, if you desire. All under a palapa roof to protect you from the sun during the day - true paradise found! 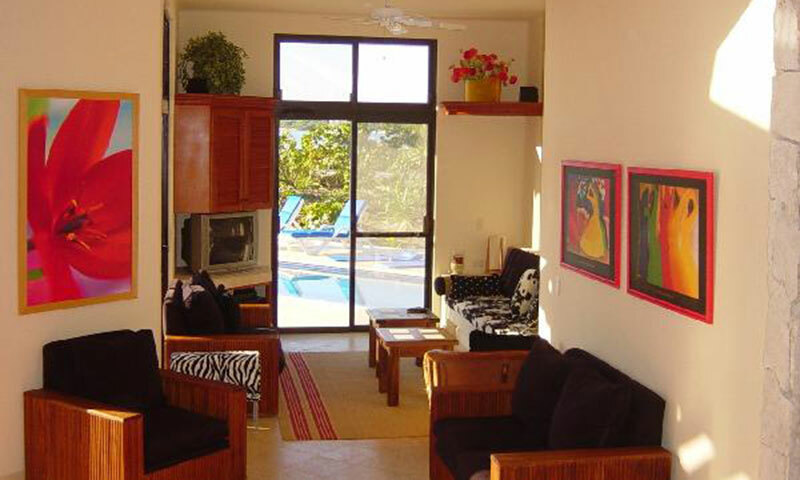 Note: Casa del Sol Naciente can be rented with Zen del Mar next door for larger groups. Price above is weekly rent for 10 guests at the Villa. Villa sleeps 12. Each additional guest add US$800.00/week (add US$1,000/additional guest for holiday weeks).